From intimate gatherings to classy weddings, The Lodge Franklin is the perfect place to gather. Whether your “big day” means a marriage or a graduation, a gala or just a girls’ get-together, The Lodge gives you all the Franklin “feels” without the high Franklin prices. 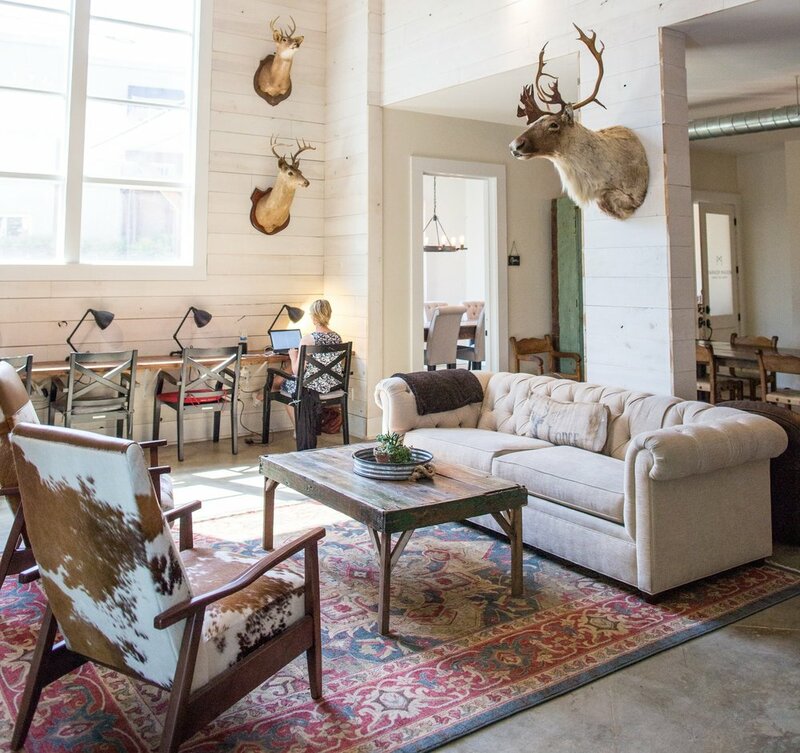 Designed by some of Franklin’s top interior designers, including Kim Leggett of City Farmhouse, our rustic modern farmhouse and warehouse, set just off I-65, provide a perfect, convenient setting for parties of up to 200. The Lodge Main is the main house on the property. The modern farmhouse feel is both welcoming and elegant, with white shiplap lining the walls and rustic industrial chandeliers hung throughout. From our farm tables to our leather Chesterfield sofa and plush velvet chairs, all of the Lodge Main's furnishings are included in the rental rate. The Lodge Main is available on weeknights and weekends. McGavock Hall is a great, open space, with salvaged steel and Tennessee barnwood-framed walls, concrete floors, pendant lights and an 8-foot industrial chandelier custom designed by Franklin's own Bjon Pankratz. The built-in bar is ideal for large events, and the two large doors can be opened to the outside when weather permits. The textured canvas of McGavock Hall provides the perfect backdrop for any large event. Rates for event rental space range from $495 to $3,990, depending on the day and length of rental. Please contact us for a quote specific to your event. Nonprofit Discount / We love the Middle Tennessee community and the organizations that work so hard to help the people who live here. That’s why we offer nonprofits a 20 percent discount on conference room and event space rentals.